for $230,000 with 4 bedrooms and 2 full baths, 1 half bath. This 2,324 square foot home was built in 2007 on a lot size of 7655 Sqft.. NEIGHBORHOOD DID NOT FLOOD IN HARVEYThis beautiful custom home by Newmark Homes is located just minutes from I45 and the 99 Tollway. This location gives you peaceful. Access to downtown Houston via I45 is less than 15 minutes without traffic. There are multiple routes into The Woodlands, which lies less than 8 minutes up Gosling from 2920. 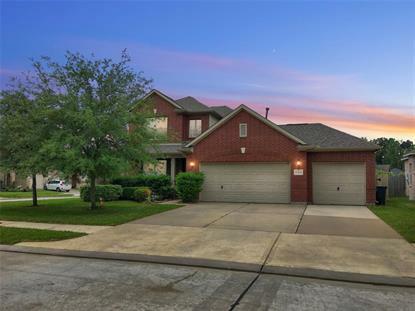 The house itself was upgraded with crown molding, dark granite counters throughout the house, wrought iron banisters on the staircase, and many more wonderful upgrades that really set this home apart from many others in it's price range. At over 2, 300 square feet of living space, this home offers more than enough room for a to each have their own rooms, as well as, a huge lofted living area upstairs. Downstairs you're met with stainless steel appliances, new carpet (never had pets on carpet), and many other amazing upgrades that make this home such a great place to live.